As part of the Faculty Leaders Program, attendees will engage with other faculty scholars from around the country who, like them, share a passion and enthusiasm for effecting change in their classrooms, universities, and communities. 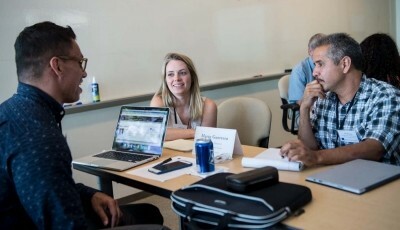 Because of the intense weeklong nature of the program, faculty leaders are engaged with one another through class discussions, group projects, and collaborating on research ideas. It is through these interactions that we have seen participants develop joint ideas and projects for consideration after the workshop is over—from sharing future opportunities for learning, to writing grants, to providing feedback on paper submissions. We invite 2-3 Program alumni to return each year so Faculty Leaders can meet members of other cohorts and make further connections. Our ongoing email network of participants from all years of the program helps to continue engagement and collaboration after each summer's program has concluded. Faculty Leaders will also enjoy spending the week at RAND in Santa Monica and meeting many RAND researchers and Pardee RAND faculty and doctoral candidates through course modules, lunches, dinners, and other direct-matched conversations. As much as Faculty Leaders are enthusiastic to meet the RAND community, our community is also eager to meet the visiting faculty! We anticipate that, through these face-to-face interactions and discussions, longer-term relationships can form so collaboration will continue long after the workshop is over.